Mary Miller, Sterling Professor of History of Art, has been named the senior director of the Institute for the Preservation of Cultural Heritage (IPCH) at Yale’s West Campus. The institute is now a recognized hub for new partnerships connecting cultural heritage, science, and conservation at Yale. Last spring, IPCH was at the forefront as Yale hosted the United Nations Global Colloquium of University Presidents, bringing together presidents, vice chancellors, and experts in a broad coalition of support for research and education in cultural heritage preservation. Professor Miller, of course, brings considerable experience and expertise to her new role at IPCH. 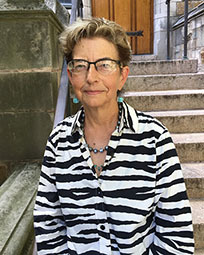 She is former dean of Yale College and head of Saybrook College; an esteemed teacher, who has worked with Yale students at all levels; and a respected colleague among the art of the ancient New World, Miller is a world-renowned scholar, who has combined research, teaching, and field work. A specialist of the art of the ancient New World, Miller curated The Courtly Art of the Ancient Maya at the National Gallery of Art, Washington, D.C., and the Fine Arts Museums of San Francisco in 2004. For that exhibition, she wrote the catalogue of the same title with Simon Martin, senior epigrapher at the University of Pennsylvania Museum. Among her other books are The Murals of Bonampak, The Blood of Kings (with Linda Schele), The Art of Mesoamerica, Maya Art and Architecture, The Gods and Symbols of Ancient Mexico and the Maya (with Karl Taube), and A Pre-Columbian World (co-edited with Jeffrey Quilter). She has most recently completed Painting a Map of Mexico City (co-edited with Barbara Mundy; 2012, a study of the rare indigenous map in the Beinecke Library) and The Spectacle of the Late Maya Court: Reflections on the Murals of Bonampak (with Yale graduate, and now professor at the University of Chicago, Claudia Brittenham; 2013).